On a historic building in Place Royal in Old Quebec City in Quebec, Canada, a famous wall mural adorns the facade which was created by twelve artists. The wall mural is called La Fresque des Quebecois and during the evening hours, bright lighting is turned on to highlight the beauty of the masterpiece. 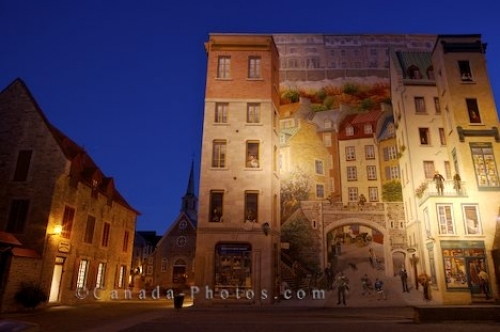 La Fresque des Quebecois, wall mural, in Place-Royale during blue hour in Old Quebec, Quebec City, Quebec, Canada. UNESCO World Heritage Site. Picture of the lighting on a beautiful wall mural on a historic building in Place Royal in Old Quebec, Canada.